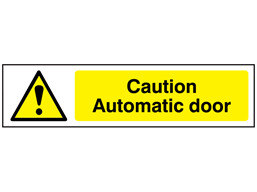 Home > Safety Signs > Hazard Warning Signs > Machine Hazard Signs > Caution Automatic door, mini safety sign. Caution Automatic door, mini safety sign. Automatic start warning symbol label. Caution Test area symbol and text safety sign. Do not clean or oil moving machinery symbol and text safety sign. No escape symbol safety sign. Caution Automatic door. Part of our mini safety sign range to prevent accidents from inadvertent collisions with or entrapment in automatic door systems. Mini safety signs. Caution Automatic door. Small format. Signs comply with ISO 1710, and the Safety Signs and Signals Regulations 1996. MIWS5112 Size 50mm x 200mm. Material semi-rigid plastic with adhesive backing.